MS SQL to MySQL Database Conversion Tool provides the way to convert bulk database records created in Microsoft SQL database to MySQL database server. Software facilitates you to establish connection between MS SQL server and MySQL database using either windows authentication or SQL server authentication as per your requirement. 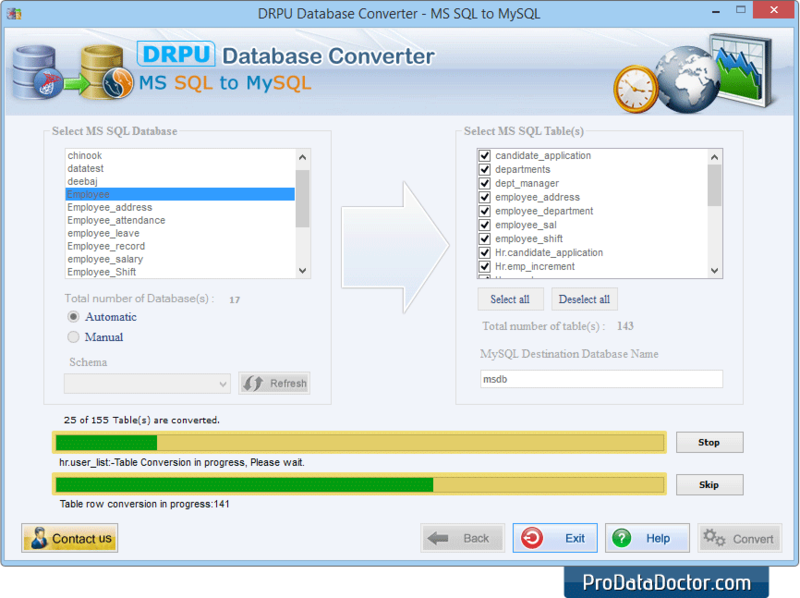 MS SQL to MySQL database converter migrate whole or selected database table(s) from MS SQL to MySQL database. Using this software you can convert views, stored procedures and other table attributes. Database migration utility supports indexes, primary key, default value (null value, Unique and primary key constraints) and all necessary data type attributes for easy database conversion. Software provides facility to skip converting indexes, if you do not want to convert database indexes. Database converter utility provides user friendly interface and does not require any special skills to use the database conversion tool. Convert entire or selected MSSQL created database records into MySQL database according to user’s choice. Support all database datatypes, attributes, indexes, queries and foreign keys etc while converting the database records. Facility to convert stored procedure. Provide systematic help manual section for user’s assist.